Is your free time valuable? Are you physically unable to be in two places at the same time? Do you have tasks that need to be done, when you don't have the time, or would rather be doing something else? Do you ever wish you had a clone? 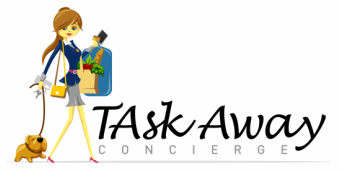 If you answered YES to any of these questions, TAsk Away Concierge can help you! Check out our services page for a list of our services, and submit your to do list, so you can get back to living your life! And remember, if there is anything you need to have done, but you do not see it on the list, just TAsk us and we will let you know if it is something that we can get done for you. Trained and Certified by the World's Leading Concierge Trainer, Katharine Giovanni with Triangle International. Proud Member of the International Concierge and Lifestyle Management Directory, Greater Atlantic City Concierge Association, Mays Landing Merchants Association and Marlton Business Association.